Korea’s Cigarettes are $4. Let’s Quit Smoking. The price of Korea’s cigarettes per package was about $2.2 on average until December 31, 2014. 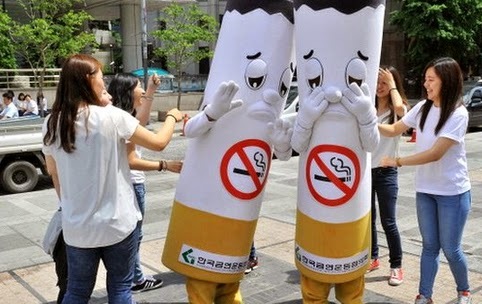 The smoking rate of Korean men had been 40% so far. has risen up to $4 since January 1st, 2015. It is a government policy to increase tax and reduce smoking rate. cigarette package. It is almost $15 in Ireland. Southeast Asian countries, some Latin American countries, and India. from 2015, and is now similar to Spain and the U.S.
Let’s all quit smoking in the new year in 2015. Let’s quit smoking as a cleverer and wiser person. Smoking does not remind of James Dean anymore.